Jack Strong Takes a Stand by Tommy Greenwald. Review: After Jack Strong goes from class to class and gets tired from all he has to do, will he stand up for himself by saying no? Will middle school student Jack Strong's rebellion to not be overscheduled work? Find out in the book Jack Strong Takes A Stand by the author of the Charlie Joe Jackson series Tommy Greenwald. 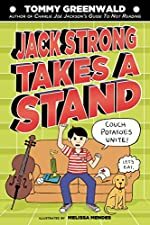 Jack Strong Takes A Stand is a book about an 11-year-old middle school student named Jack Strong. Jack has been taking classes that he has not liked for years, and he has been rushing from activity to activity to be ready for college. He does everything from practicing sports all the way to studying different languages. But one day after school Jack is super tired from school and he asks his parents if he can skip soccer practice just this once and they say no. That is it for Jack, and he starts a rebellion. But after a few days, will he get famous? Jack doesn't realize all the attention that can come from a rebellion though. Will he be able to handle it? But after all the fame and the family fighting are they able to put this aside for something more important? Jack Strong Takes A Stand is a astonishing story. Greenwald has made all these characters realistic. For example his writing makes Jack sound very realistic because anyone who is so over scheduled with all those activities would be very frustrated just like how Jack feels in the book. Also Greenwald uses unexpected twist that keeps readers on their toes. It is very cool how Greenwald uses the imagination of a middle school kid. For example he used Jack's imagination to have a crush on Cathy Bellows. Another thing that was very realistic in the story is Jack's family. What is very realistic is that families fight just like Jack's family does also the kids want to stand up for what they believe or sometimes they will talk back just like Jack does. A few parts of the story are not as realistic such as how Jack can get famous from a school newspaper to being all the way on his favorite T.V. show just for rebelling. But really honestly I loved this story. It addresses an issue for kids today - being over scheduled. So if you are looking for a good book to curl up and read, try Jack Strong Takes A Stand by Tommy Greenwald. We would like to thank Roaring Book Press for providing a copy of Jack Strong Takes a Stand for this review. Have you read Jack Strong Takes a Stand? How would you rate it?